Reading the trainers thoughts - "He just does everything so easily and we never push him, today he isn't even revved up for this. He has had two gallops coming into this so he isn't even cherry ripe yet." Perhaps that is why he was so brilliant. If he was screwed down for the race he'd probably be more dour. Is he entered in the Slipper ? The Skyline is 3 weeks from last Saturday and 3 weeks before the Slipper. If he has an entry for the Slipper why not go this way, The Sires is 2 weeks after the Slipper and the Champagne is 2 weeks after that. He could run in all 4 of those races without it causing too much harm. If in the Skyline he is not impressive than rule out the Slipper, but I do not think they should rule it out completely. This looks an ugly race for him. Win lose or draw I like what his trainer said pre race. Is Castelvecchio the forgotten horse of the Inglis Sires? 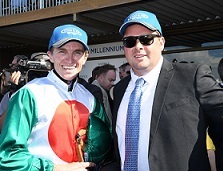 Josh Parr and Richard Litt after Castelvecchio's Millennium win. (Pic: Steve Hart). It wasn’t that long ago the Dundeel colt with the booming finish was favourite for Saturday’s $1 million Group 1 feature and perhaps it’s a case of 'out of sight out of mind', or some recency bias with the Golden Slipper fresher in the mind. As far as trainer Richard Litt is concerned, he doesn’t mind not having the pressure of heading into his first Group 1 race with the favourite but is also a little puzzled because he can’t see what the youngster has done wrong. Castelvecchio won his first two starts, including the $2m Inglis Millennium, then ran a fast finishing third in the Skyline Stakes behind Golden Slipper runner-up Microphone before a freshen up and a closing fourth in a 1045m trial last Friday. “From what I can see people looked at his trial and thought he could do a bit more,’’ Litt said. The colt was $8 TAB favourite when nominations were taken for the Inglis Sires (1400m), he was $7 equal favourite earlier this week on acceptances but has fallen out of favour to be $10 on race eve. Litt said from his perspective the build up to finally getting Castelvecchio out to 1400m has been faultless and said he purposely didn’t throw the blinkers on in the trial. “He had a nice gallop on Tuesday and came through that really well,’’ he said. “We’ve done everything right by him. Three weeks into the Millennium, two weeks into the Skyline, a little bit of a break and three weeks prep into this. “We’ve taken our time and never put him under too much pressure so he’s going in a nice fresh horse. A look back at the Skyline Stakes (1200m) on March 2, from a Punter’s Intelligence sectional perspective, Castelvecchio conceded an impossible start – when Microphone hit the lead at the 200m he was 14m behind and 7m off the second last horse. The race was run faster than the other two 1200m races on the day and Castelvecchio posted a last 600m of 33.91, the fastest by a two-year-old, and a last 200m of 11.43. Litt said all things considered the horse couldn’t have run any better under the circumstances. “Good pace up front is what we need and I can see that happening,’’ he said. “And a bigger field, 14 horses is going to be to his advantage. The other day the small field didn’t work for him, there was nothing for him to track into the race. Most speed maps have Castelvecchio settling last and could eventuate though Litt said stepping up in trip could bring about a small change but won't be asking jockey Josh Parr to make a deliberate one. “We can’t be changing his pattern but he could be a little bit closer, he doesn’t have to be out the back scrubbing and I think over 1400m he won’t be,’’ he said. Litt has been saying all preparation he thinks Castelvecchio is a horse that will come into his own as a three-year-old over more ground but he could press on to the Group 1 $500,000 Moet & Chandon Champagne Stakes (1600m) in two weeks. Given Castelvecchio is Litt’s first starter in a Group 1 race the occasion isn’t lost on him nor the significance of what a Group 1 win could mean. “I know how hard it is to find a good horse, people go all their lives, and we’re not leaving any stone unturned,’’ he said. Good to see the horse win his Group 1 today. Although not exactly a cheap horse at $150 000, his win in the Champagne Stakes elevates him into the position of the second best male 2 year old of the season and gives him a valuation somewhere above $30 000 000 you would suppose. It will be interesting to see if the connections hold their nerve and wait until his 3year old or 4 year old season before accepting a major stud deal. With The Autumn Sun and Winx both retired leaving , there is quite a good chance of him becoming the outstanding horse in Australia over the next few years.